A few weeks ago, I wrote about my wish for an easy Web 2.0 solution to collaboratively create and share charts and graphs online. Within the next few weeks, ITM readers were quick to offer their favorite tools and Google did indeed launch the much anticipated Chart Feature to Google Spreadsheet. I enjoyed exploring the solutions you offered in your comments and hope that sharing that process might provide educators time-saving insight and ideas for applying the unique features of each of these applications to different educational goals. Mr. Freer suggested http://instacalc.com/. You can't get much simpler than Instacalc. It's very easy to embed the calculator or a link with some preliminary formulas and data as a part of a challenge problem posted to a web page, wiki, or blog in any subject area. Engage your students during a science or social studies class by providing a critical thinking prompt and InstaCalc containing data pertinent to your lesson. The natural and readable number and equation language makes this calculator tool very appropriate to use with younger students who might find cell references somewhat abstract. Since no login is necessary to use InstaCalc, elementary teachers can easily use it with students under 13. Unfortunately, there is no graphic interface for creating graphs and charts. And even though, the coding for adding a graph of your calculation data is not difficult to learn, it would not be my choice for teaching younger children how to create charts and graphs. InstaCalc is a good tech integration tool that preserves the focus on the lesson, because it has a simple learning curve and a short setup time. The Instacalc Blog offers many tips for using this powerful tech tool. Give this shared calculator a try and figure out What the radius of a circle should be for the volume and area of a sphere to be equal? To include simple graphs and charts as part of your lessons , you might consider ChartAll.com which can also be used without setting up a login. Logging in allows you to save your graphs. Browsing the charts, I found several classrooms making use of this simple tool to analyze basic data such as Distribution of Blood Types Within a Classroom. In his comment, Dave from ChartAll.com suggest selecting the "Data from a Google spreadsheet" and then typing the key of a "published" spreadsheet. I loved this idea, but would suggest having plenty of time to learn the limitations and the strengths of this tool if you plan to use it with Google Spreadsheets. After several attempts to graph a 7th grade class project comparing the number of jumping jacks students could perform over time for a Math unit on Variables and Patterns, I concluded that our Google Spreadsheet data would have to be changed from rows to columns to produce useful results with this tool. However, ChartAll's linking and embedding features were quite easy to use and provided a useful tool for creating and sharing basic graphs on line. For more complex data analysis, try charting the data using Swivel.com which was suggested by ITM reader Kathleen. Our class Jumping Jack data collected using Google spreadsheet imported easily into Swivel, and the site provided us with many ways to look at our data, including disaggregations and summaries we had not considered. If you're a real data geek, Swivel will keep you busy for hours with its wealth of features. Again, we discovered that the graph we were looking for required graphing rows, and Swivel seems limited to charting columns, so our results weren't exactly what we were looking for. However, Swivel's many shared sets of data, graphs and tools are testimony to the value of Web 2.0 in education. The site is full of fascinating materials and prompts for classroom discussions to accompany lessons in a variety of curricular areas. How about this Swivel graph to accompany the blood type data these students graphed using ChartAll. Finally, many of you wrote to me as soon as you spotted the announcement that Google Docs and Spreadsheets launched the anticipated CHARTS and GRAPHS feature. I can't wait to check out this new Google Spreadsheet feature, and promise to report in as soon as I put our Jumping Jack data to the test. Dive-in to see amazing examples of how students are using a wide-range of innovative tools in the classroom. Dive into our Virtual Open House! We can talk all we want about "cool tools," but it doesn't mean much until we see how it impacts kids. So, this episode is all about students: what interests them, how they understand and generate knowledge, and the amazing things they can do when we give them the right tools and guidance. It's time to let the kids show off! BTW - if you've got great clips of student work, send them our way. We'd love to include them on the ITM. > While you're at it, check out a different Star Wars MacBeth video that was produced back in 1997 by students from Glen Ridge High School, New Jersey. The creators digitized it and put it online with behind the scenes details on how it was produced. > "Does History Repeat Itself?" is a project from City Arts and Tech High School, San Francisco, CA. > Lemelson-MIT InvenTeams is a non-competitive initiative that awards grants up to $10,000 each to teams of high school students, teachers, and mentors to identify a problem and invent a solution for it. Designed to excite, empower, and encourage students through hands-on problem solving, InvenTeams aims to inspire a new generation of inventors. Initial applications are due April 27, 2007, or e-mail questions to inventeams@mit.edu. And if you live in the Boston area, plan on joining them at the InvenTeams Odyssey, June 19-23, 2007. > The Envision Schools Project Exchange is an online workspace for Envision teachers to share best practices in project design and implementation. It's an initiative of Envision Schools - a network of high performing charter schools in the San Francisco Bay Area. Be sure to check out the Holocaust & Genocide Museum project. > Rock Our World is an international collaborative project led by Carol Anne McGuire and her students in Orange Unified School District. During the project students use video conferencing and media production to collaborate on challenges and learn about the world. ROW 6 is called "Are You Game", and it involves 20 schools from 6 different continents. Look for their live webcast on June 9th! > ITM Correspondent Mark Wagner talked to kids at the CA Student Technology Showcase during the 2007 CUE Conference. Explore Cypress High School's "Digital DNA" project, Eureka High Schools "East Lab", and the great work being done at Echo Horizon School. Special thanks to the students from Rock Our World for their shout outs! And to Mike Morrison and Scott Smith for helping me take my first Segway experience! Here at the ITM, we've all been writing a lot about Web 2.0 technologies, and I thought I'd share with you a few services I use to manage and improve my work life. This week, I am focusing on newsreaders. Web 2.0 magic started for me in the spring 2005 when, as a newly minted Apple Distinguished Educator, another far more techno-savvy ADE shared with me an OPML file and directed me to the web-based newsreader, Bloglines. I created a Bloglines account, imported Mark's OPML file, and instantly, I could see all the web sites he read and tracked. I was hooked by this method of collecting web-based content in one convenient place. Since that fateful file import, I've explored other newsreaders (also called news aggregators) and finally settled on a piece of Mac-only software called NetNewsWire. As you might be able to tell in this screenshot, I have my feed subscriptions organized in folders, and I can easily browse my personalized content. I don't read every subscription every day, but I do skim material regularly, using NetNewsWire's flagging feature to mark items that I want to explore further. NetNewsWire has many other useful features including smart lists (similar to smart playlists in iTunes) and special subscriptions of feeds from tags, search engines and bookmarking services. It’s also possible to share your feed subscriptions with NetNewsWire users others on the same network. 1) First, get a newsreader. I suggest Google Reader or Bloglines, both web-based and free. I use Bloglines in addition to NetNewsWire because it has social capabilities; you can see other users' public feeds if they have made them available. 3) Import this file into your newsreader of choice, and browse these feeds. Warning: there are a lot of feeds contained in this file! Here is a tutorial for Bloglines, and check out this one and this one on Google Reader. 4) Find a few things that you’d like to subscribe to from this list or this list. 5) Extra Credit: If you are already an RSS aficionado, export an OPML file of your favorite feeds and pass them on to me at elemenous@gmail.com. I’m always looking for new reading material! The volume, diversity, and power of new read/write web or web 2.0 tools which continue to emerge almost every day is amazing. While these tools can be awe-inspiring, the fact that many classroom teachers remain unfamiliar with more "mature" read/write web tools as well as newer ones represents a "digital knowledge divide" that is widening fast. When I share collaborative research, learning and digital storytelling tools like Flickr, del.icio.us, Google Notebook, Google Reader and Ning with many classroom teachers, I sense I'm unintentionally inviting a "shock and awe" experience instead of one where teachers walk away empowered and confident in their ability to use new tools effectively with students. Such an outcome is counterproductive to the goal of helping teachers use digital technologies effectively for learning. I'm finding the video "Introducing the Book" to be better and less threatening to use in starting educational technology workshops with classroom teachers, rather than movies like "Did You Know" or "The Machine is Us/ing Us." I don't see any signs the proliferation of read/write web tools is going to slow down soon. There are many places to go to learn about new (and "older" / more mature) web 2.0 technologies. Karen Montgomery has a good list of sources, including S. Summerford's Filamentality hotlist "Web 2.0 for the Classroom Teacher" and "Go2Web2.0." Andrew Churches has done some great work along these lines as well, tying in Bloom's taxonomy, and created the wiki "Educational Origami" in response to the post "Read/Write Tools Chart" by Miguel Guhlin. Andrew's framework and lists include desktop applications (mainly for Windows-based computers) as well as web-based tools, contrasting traditional versus digital approaches to teaching as well as how the 2001 revision to Bloom's taxonomy by Anderson and Krathwohl relates to digital teaching alternatives. Which framework is best or will prevail? I won't claim to know, but I think each of these reflections can add to our own cognative map building of web 2.0 tools and appropriate uses. Our digital toolset will continue to morph and grow in the years ahead, while our need to understand appropriate uses for these protean tools will undoubtedly persist. Edubloggercon 2007 – This first-ever, international, all-day “meetup” of educational bloggers will take place on Saturday, June 23rd, at the Georgia World Conference Center in Atlanta just before the start of NECC. All are invited–whether you yourself blog, are just an educational blog reader, or even just want to hang out with an interesting group of people. The event is free, and you can indicate that you are coming (and see who else will be there) at the Edubloggercon wiki. Edubloggercon 2007 will be unique in that it is going to be organized by the participants in real time at the wiki. We have access all that day to the large Open Source Pavilion room at the Conference Center and there will be free wi-fi: beyond that is up to you. So come join the discussion and help us plan a fun and stimulating experience. How do we teach kids to cross a busy street? 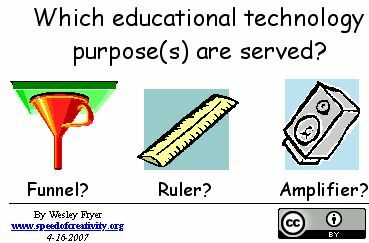 It seems that everywhere I turn lately, I find educators struggling over how to responsibly move forward with the use of Web 2.0 tools in an educational setting. Ed-tech leader, Ed Barry, recently asked Vermont colleagues to share what PROCESS they use in deciding which tools to allow in their schools? Most of the answers offered referred to the school’s Acceptable Use Policies, with many of us agreeing that our AUP’s need updating. I walked away from this meeting eager to research AUP’s that supported a School 2.0 environment and the process used to design them. The insightful post and comments I collected on the topic, left me with more questions than answers. So instead of a summary, I offer you a list of questions that these writers touch on, and invite you to peruse their insight and share your own thoughts. How can we support an institution with desires to seek innovation in teaching, learning and research; willingness to innovate & a growing culture of sharing? How can schools ensure that they are fulfilling their duty of care to ensure safe environments for their students? How do we promote a culture of social responsibility? Must we reach beyond Acceptable Use Policies? How do schools make and enforce rules when students are not on school ground or acting as part of a school function? Should our AUP’s reflect understanding of changes in our culture? Should AUP support us to change our culture? How do your AUP's integrate IT policies with Institutional policies? What key principles are your AUP’s based on? What is the best approach to deploying risk assessment and risk management ? What legal risk do schools face? Is your AUP used as a control mechanism to prevent usage which IT staff may frown upon? Does your AUP work on behalf of your organization in helping to ensure the effective use of IT by its users? Why do we hide behind AUP’s?Where did our policy come from? Is it infallible? What mechanism do you have for changing your AUP and engaging your users in that change? How does it take into account the facts that technologies change, usage changes, and culture changes? Is your AUP simple or sophisticated enough to accommodate for technical and organizational complexities we face in the 21st century? Should we wait to evaluate and master immature technologies before permitting them? How can we provide safe environments, minimize risk, allow learning and encourage enthusiast? How can we develop policies around technologies that are a massive productivity enhancer and also a great time sink? How can schools fulfill their duty of care to ensure safe environments for their students? Can AUP’s guide us towards an agreed role and agreed manner of operation for that role? Should time tested principles such as ETHICS be at the center of our acceptable use policies? How do we involve students in the process of updating AUP’s? Teachers often ask me "how do you find these things?" or "how did you know about this?" Much of the time I don't have to find or even look for innovative new things, because the news comes to me... and not because anyone is sending it to me, but because I'm using a tool called RSS, or Really Simple Syndication. Once you learn about RSS, learning about other new tools becomes much easier, which makes RSS a potentially very important thing for educators (and students) to understand. RSS allows you to subscribe to online news and updates that are important to you. Once you subscribe to a source, you no longer need to visit that individual web site to check for updates... the updates come to you. Searching or browsing the web is a good way to locate sources initially, but once you've located them there is no need to return to them over and over. If they offer an RSS feed, all you need to do is subscribe. TIP: Subscription, by the way, is FREE. An RSS feed is really just a file (on a webserver) that includes information about the updates you are interested in. RSS is a lot like HTML, the programming language behind websites. Web browsers (like Internet Explorer, Firefox, or Safari) can read HTML code and display a web page for you. RSS code is very similar, but must be read by an RSS aggregator (or reader), which can then display the update for you, including any enclosured files such as PDF documents or podcasts. What is an RSS aggregator (or reader)? An aggregator, sometimes called a reader, collects (or aggregates) all of your subscriptions in one place, like a magazine rack in your house or classroom. Once you subscribe to few sources, you no longer need to visit each site, you simply open your aggregator to read any new updates. The experience can be a lot like reading email, but can also be thought of as reading your own customized newspaper. TIP: Web based aggregators such as Bloglines and Google Reader are particularly popular with teachers because they let you check your feeds from any computer, while aggregators like NetNewsWire (Mac) or FeedReader (Windows) have more options. iTunes (Windows or Mac) includes an aggregator for subscribing to Podcasts. How do you subscribe to a feed using your aggregator? Most aggregators have a subscribe button of some kind. Generally, all you need to do is locate the web address of the RSS feed (see the tip below), copy the address, click on the subscribe button in your aggregator, and then paste in the address. From then on, any new updates will appear in your aggregator and save you the trip back to the website. TIP: Most sites with an RSS feed provide a link on their main page, often in a side column, and often indicated by an icon such as the orange one pictured above, or such as the ones here at the ITM, depicted (and annotated) to the right. Notice that sometimes a direct link is used for subscribing to a particular aggregator such as Google Reader. Why do you need RSS? Now that it is as easy to create online content as it is to consume it, the amount of information available online can be overwhelming. Once you find a trusted source, you want to be able to take advantage of future updates. However, you don't want to waste time checking sites when they haven't been updated... and on the flip side, you don't want to miss a potentially important update because you haven't checked back in a while. Ultimately, RSS saves you time by brining the updates to you when they are available. What can you subscribe to? RSS was initially intended to help people subscribe to news updates. Not surprisingly, many news sources have RSS feeds (also called news feeds). Check out all of the specialized feeds available at CNN.com, including an Education feed. Blogs may be the most common source of RSS feeds. Almost all blogs have an RSS feed of some kind, if not several. As you can see the ITM offers a feed. If your students are blogging , you an subscribe to your student's blogs. For instance, if I were teaching high school English again right now, I wouldn't want to visit 180 student blogs to see who had answered their reflection questions, I'd want the updates to come to me as the students posted them. Also, for your own professional development you can subscribe to other educators' blogs... or even the ITM. Visit supportblogging.com to learn more about educational blogs and to find blogs to subscribe to. Podcasts are another common source of RSS feeds. In fact, podcasting wouldn't be possible without RSS. Teachers often ask me what makes a podcast different from simply posting an mp3 file on their homepage... and the difference is RSS, which allows others to subscribe to a podcast and listen to it (or view it) at their own convenience - even on their iPod. You can subscribe to student podcasts (from your school or others) and to other educators' podcasts... or even the ITM shows. iTunes is a common aggregator used particularly for collecting podcasts. Visit the Educational Podcasting Network (or the Education category in the iTunes Podcast Directory) to learn more about educational podcasting and to find podcasts to subscribe to. Other Web 2.0 (or read/write web) tools also commonly include RSS feeds. Most wikis allow you to subscribe to any changes. So, if students are posting to a group work wiki or making changes on the class wiki, you will be notified. Also, services such as social bookmarking (like FURL or del.icio.us), photo sharing (like Flickr), or even web searches (such as Google News, MSN Search, or Technorati) can provide additional sources of RSS feeds. This can be like having your computer research for you 24/7! Where can you learn more about RSS in Education? Will Richardson shares an excellent eleven page guide to RSS for educators. Also, feel free to leave your questions in the comments. The ITM bloggers and readers can help. Image Credits: The RSS logo comes from the Wikimedia Commons. The annotated diagram of the ITM feeds I created with Snipping Tool 2.0 on my HP TC4200 Tablet PC. As a native of "The OC" and a "Son of Westwood," I'm proud to announce that the next Google Teacher Academy will be held in Santa Monica, CA, on May 23, 2007. With two successful Academies under our belt, Google's FREE training program for K-12 educators is "going Hollywood." The Academy is an intensive, one-day event where participants get hands-on experience with Google's free products and other technologies, learn about innovative instructional strategies, collaborate with exceptional educators, and immerse themselves in an innovative corporate environment. Upon completion, Academy participants become Google Certified Teachers who share what they learn with other K-12 educators in their local region. 50 outstanding educators from Southern California (within 90 miles of Santa Monica) will be selected to attend the Academy based on their passion for teaching, their experience as leaders, and their use of technology in K-12 settings. Each applicant is REQUIRED to produce and submit an original one-minute video, and applications for the event in Santa Monica are due on April 23, 2007. So far the Academies have been a wonderful experience for everyone involved with 97% of all attendees rating the Academy as "outstanding." "The focus on innovation in education and not just about the tools was right on target." BTW - In case you're new to the ITM, my colleagues and I at WestEd coordinate the Google Teacher Academy program with our friends at Google. Cristin Frodella leads Google's K-12 education efforts, and she's the guiding force behind everything. WestEd and its partners, like CUE and Discovery Educator Network, are proud to work with Cristin on this program, and we're excited to see the program reach more educators across the country. Please spread the word to anyone who may be interested in joining us!